“Our mission is to provide information, education, and resource assistance to families and loved ones in their journey from addiction to recovery. Check Facebook for updates of things going on at Let’s Get Real Inc.
Are you in need of NARCAN ? time to get trained on how to use it. These kits are free for anyone and you do not have to be a Lorain County resident. 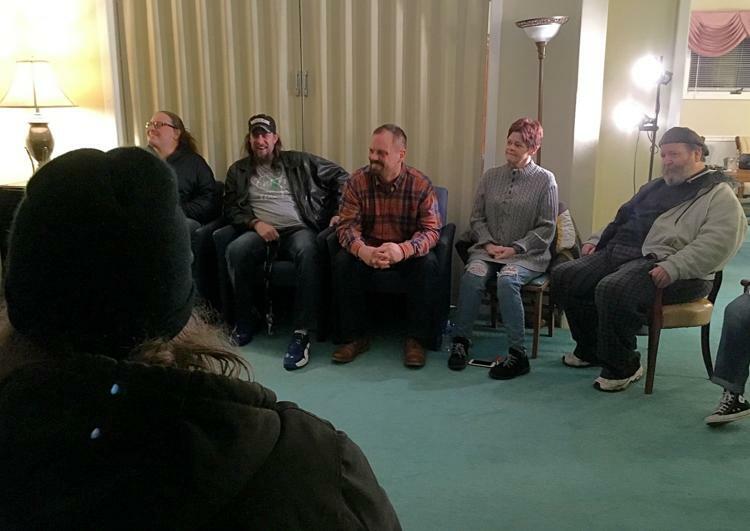 From left, Let’s Get Real Inc. Executive Director Kim Eberle and board members Marnie Butler, Larry Heller, Ken Blackman, Jennifer Digiandomenico and John Benko sit at the building that will become the new offices of the Vermilion-based recovery community organization. Let’s Get Real will move its headquarters to the former Dombrowski-Riddle Funeral Home, 1939 Oberlin Ave., Lorain. Remember when we said we had a BIG ANNOUNCEMENT? Let's Get Real, Inc. has a new building in Lorain which will help us to expand our services to the recovery community and their family members. Our organization was offered the opportunity to acquire the former Dombrowski-Riddle Funeral Home building (which was donated) at a time where we have experienced tremendous growth since Let's Get Real's inception by Director Kim Eberle. ​This new location will allow us to expand services to our clients and their families. We are still planning on keeping our second location in Vermilion because we do serve clients in both Lorain and Erie Counties. Because all of this happened in a short amount of time, our organization is at a CRITICAL transition to generate funding quickly for some unforeseen operational expenses until we can apply for grants. There is going to be a huge fundraiser on July 14th that the VermilionLionsClub & German's Villa is hosting for Let's Get Real. Tickets are still available and if you are unable to attend, you can make a donation directly to our website (or simply click the donate button below). We would like to thank everyone for their continued support during this transition and look forward to serving the immediate needs of our clients. The Alpha House Recovery House Banquet on December 18, 2017. Consider donating some Gift Cards!!! One thing that could help our agency year round are donations of gas cards and $10 fast food gift cards. This generous type of donation can help us when our Recovery Coaches help with clients getting them to and from treatment when we transport them. Please feel free to either mail them or drop them off at our office. Unfortunately when some of our clients walk into our office, they have lost everything or have very little or no personal items like clothing. We help them by taking one more obstacle out of the way to give them some dignity giving a fresh start with their recovery journey. We have also teamed up with the online Facebook support group TAP United to distribute their Angel Blessing Bags that contain personal care items. We are accepting gently used Mens and Womens clothing, shoes, jackets, coats. We will also accept NEW socks and underwear for men and women along with NEW personal care items: shampoo, conditioner, bar soap, body wash, toothbrush, toothpaste, hair brushes, combs, deodorant, various types of feminine hygiene products. Let's Get Real, Inc. is a 501(c)3 non profit Recovery Community Organization. We connect people who seek treatment. Please consider making a donation today. Copyright © 2019 - Let's Get Real Inc. - All Rights Reserved.